Only 2 more weeks in Burkina for this trip. In the past week the weather has drastically changed: cool night (20/22o C) still 38o C in the day time. The wind Harmatan is blowing, bringing a lot of dust in the air and this coolness at night. It is at least 3 weeks too early. At the end of the rainy season there are normally a few days when flying ants come out. At night all the street lights are flocked with them. This year we did not have this phenomenon? 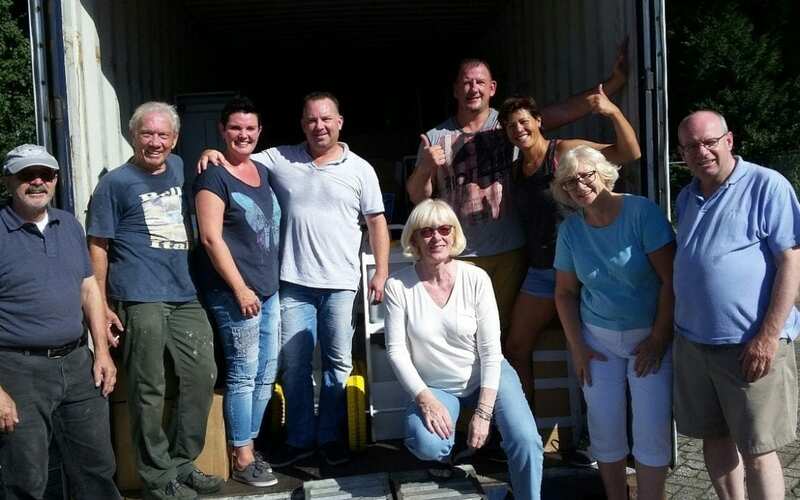 On September 9 and 10 we loaded a 40 feet container in Baarn. The container arrived in Bobo Dioulasso on October 29. We finally had access to the goods last Monday. The container has to be unloaded for custom clearance, then it is loaded again so that the goods can be stored at our office or at our house. People unloading the container at our office. 50% of the costs of the shipping is sponsored by the company Kuehne and Nagel. Beginning of August, a new director was appointed for the LAP. After 3 weeks we had to release him. He was a little bit too interested in the ladies from the neighboring villages. End September we appointed a new director recommended by one of the teachers at the LAP. Well…… I had some suspicion about his resumé. He said he had a diploma from an engineering school from Burkina, but did not understand anything about technical things. We did some digging and we also found out that all the other diplomas he claimed he had, were fake. To make it complete we also found out that he had a fake ID. Friday we went to the LAP to fire him. He went away from the LAP the same day at night. We will ask the police to confirm that all documents he gave us are fake before we start an action against him. It is sad and disturbing, but the LAP is such a good project that we have to find the right leader who can develop it. Eugénie is right saying that I will have to spend quite some time at the LAP on our next trip in 2017. In the meantime, we are looking for new candidates, but we will do a thorough check on candidate before we make proposal. A “marigot” is a river with water only during part of the year (June to November normally). There is one very close to the LAP and it is always nice to go walk along it or in it (when it is dry). This week I found out that the villagers are building a type of dike. For what and how will this type of construction resists the heavy rains??? The back and the front of the dike. There are still some ponds with water along the “marigot”. A calao and a dove seen along the walk. Wisdom is like a baobab tree; no individual can embrace it by himself. La sagesse est comme un baobab ; Personne ne peut l’entourer de ses bras. Si vous êtes rempli de fierté, alors vous n’aurez pas de place pour la sagesse.